For the second time in two weeks, Ottawa was blessed with a visiting orchestra and a famous conductor. This time it was the Mariinsky Orchestra (formerly the Kirov) and Valery Gergiev, arguably the busiest man on the planet. When last we saw Mr. Gergiev he was conducting an orchestra thousands of miles away during the Closing Ceremonies of the Vancouver Winter Olympics. In the last two weeks, he’s conducted seven Mariinsky concerts and led rehearsals and performances of Shostakovich’s The Nose at the Metropolitan Opera. One gets the sense he doesn’t have an off button. 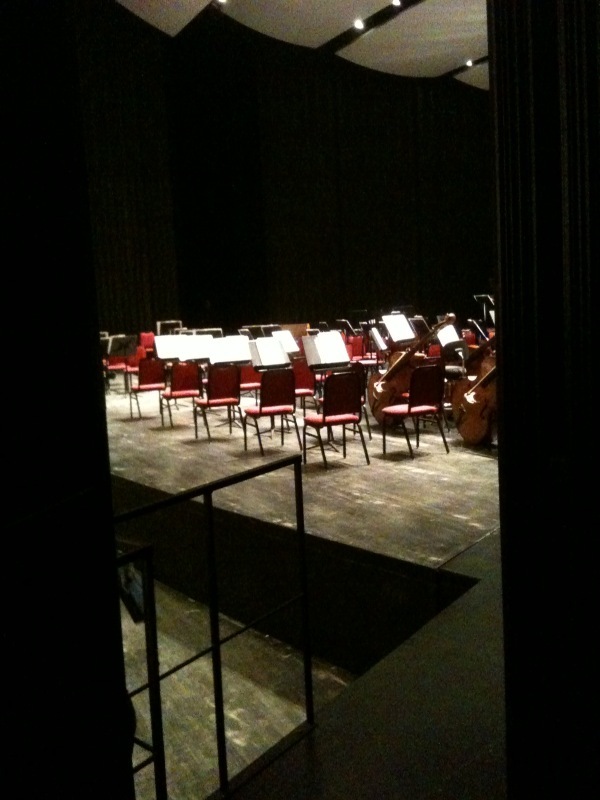 Predictably, the concert was sold out, so I found a quiet place in the wings to watch the concert. The acoustics aren’t the best, but it does give you an up close and personal look at the orchestra. It’s nice to feel the floor rumble beneath your feet when the bass section really starts to get into it. • the Mariinsky set up really far downstage – the piano was as close to the lip of the stage as possible. Not the ideal place to set up if you want the best sound in our hall, but that’s where they wanted to be. • the violas were on the outside, but they turned their chairs 45 degrees so they were facing the back corner of the shell. • the musicians took the stage en masse at 8:04 pm (our musicians are usually warming up on stage 30 minutes before the show). I like the group entrance – it adds a welcome element of theatricality. • the Concertmaster didn’t get a separate entrance, and Mr. Gergiev didn’t use a podium. Perhaps it’s a symbol of communism and equality, although I doubt it. The concert, as one would expect, was terrific. The orchestra was energetic and produced a huge sound– the timpanist in particular was ferocious (at times it was a little too much). The audience was wildly enthusiastic about Rachmaninov’s third piano concerto, greeting Matsuev’s final flourish with whistles, hoots, and shouts of “bravo”. For the second half, Mr. Gergiev left his baton behind and went with his trademark “spastic wrist and fluttering fingers” technique. I found it oddly hypnotic and kept thinking about how his hand resembles Thing from the Addams Family. I temporarily lost interest in the Shostakovich around the 35’ mark, but the final percussion section was spectacular. Such a shame that he never got around to writing a percussion concerto or ensemble piece. So, now I have to wait a month to hear another visiting orchestra. This time it will be the Montreal Symphony and Kent Nagano with a Debussy / Mozart / Stravinsky program. And after that, it’s a whole year until l’Orchestre national de France pays a visit with Le sacre du printemps. The date is April 11, 2011 – mark your calendars.